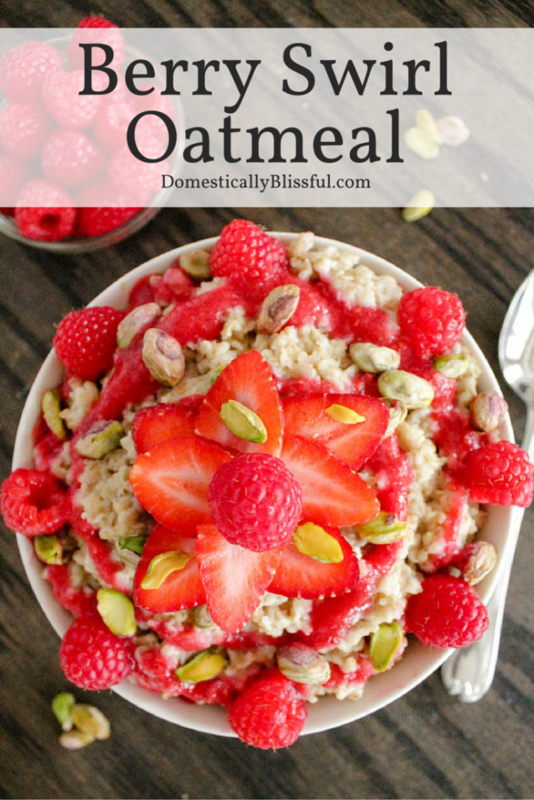 This Berry Swirl Oatmeal is a deliciously bright & beautiful way to begin your day! How much do you love bright & beautiful food? It makes me happier than I can even begin to express! Maybe it’s because I grew up around lots & lots of color! My childhood kitchen was cobalt blue, our dining room was yellow, & my bedroom? The walls were green & blue, while my ceiling was yellow & orange. So I naturally gravitate to color, especially in my food. Each plate & bowl is a blank canvas waiting to be painted with the most delicious food! Since my favorite color is pink, of course I love pink food! And right now strawberries & raspberries are plentiful, especially in Target where I found this fun display of Quaker® Oats! So I decided to join the “Bring Your Best Bowl” fun, & create a delicious bowl of oatmeal with my favorite colorful toppings! 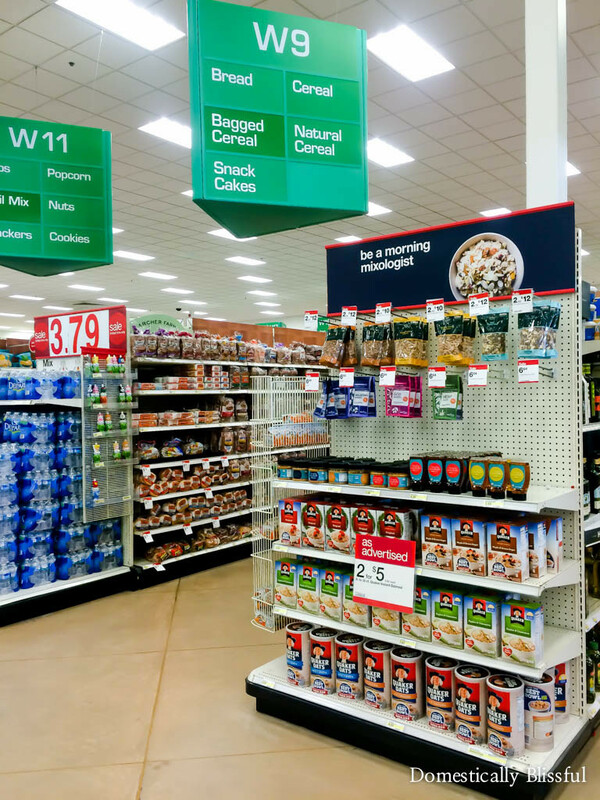 And if you are looking for yummy toppings for your Best Bowl you can find lots of choices on these special end caps at Target! If you want to join in on the fun of the “Bring Your Best Bowl“contest grab some Quaker® Oats from Target, along with 2-5 ingredients, & head on over to the national sweepstakes page for all of the details & rules. Then you can enter for a chance to win $250,000 & have your recipe sold in stores this fall! 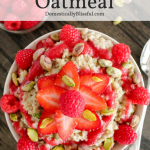 So while you are contemplating your own super creative bowl of oatmeal, I am going to keep thinking about this yummy bowl of Berry Swirl Oatmeal! 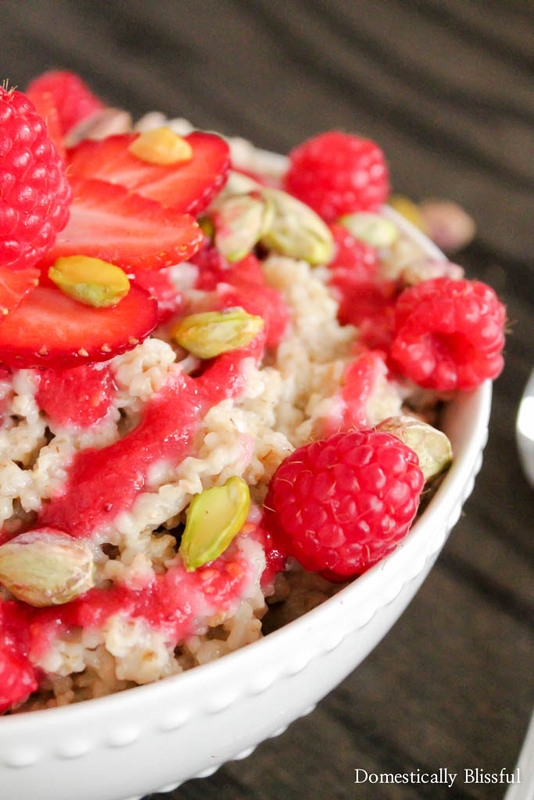 I think my favorite thing about this Berry Swirl Oatmeal, outside of the fun pink & green colors, is all of the contrasts! I love the cold pureed fruit & the hot oatmeal, the sweet berries & the hearty oatmeal, the bright colors & the neutral oatmeal, & the crunchy pistachios mixed with the soft berries & oatmeal. 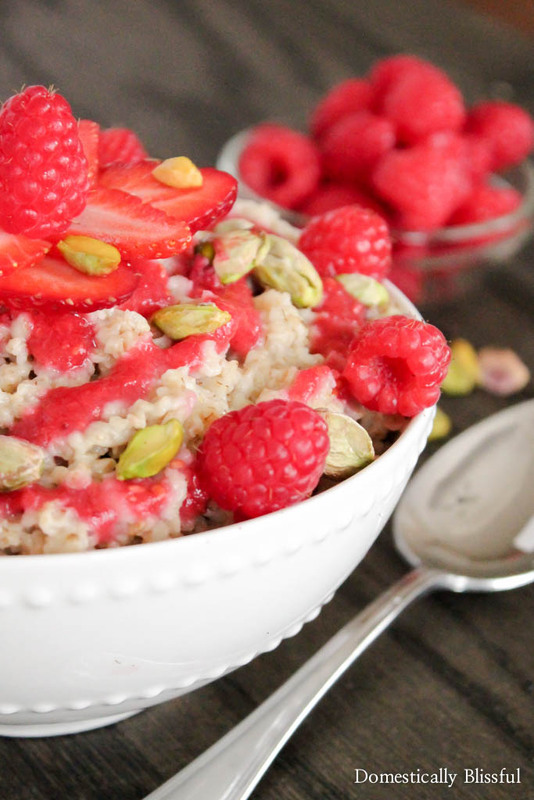 What’s also nice about this Berry Swirl Oatmeal is that it is just in time for the month of pink, specifically Valentine’s Day! 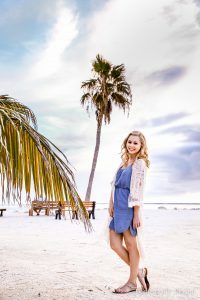 Speaking of which, you are going to be seeing a lot more Valentine’s posts in the next few weeks, so I hope you are ready to spring into the love month with me! I should also note that I am really ready to spring into Spring! What’s the point of cold weather if you don’t get snow? But until then, I’ll just eat my way to warmth! While the Quaker® Oats are cooking puree a handful of strawberries & raspberries, with a pinch of sugar, in a hand blender & set to the side. 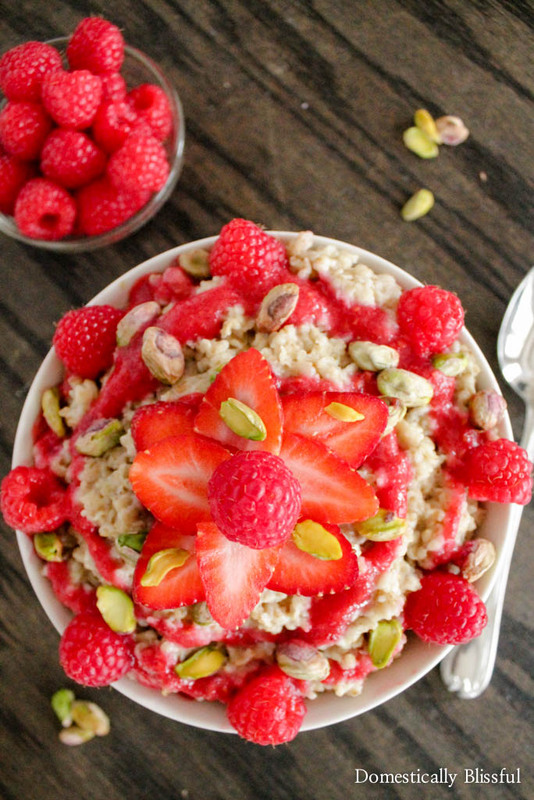 Serve your oatmeal warm in a bowl *(2) & top it with a swirl of the pureed berries, sliced strawberries, raspberries, & shelled pistachios. *2. If you normally add sweetener to your oatmeal you can do so before adding the berry swirl toppings. 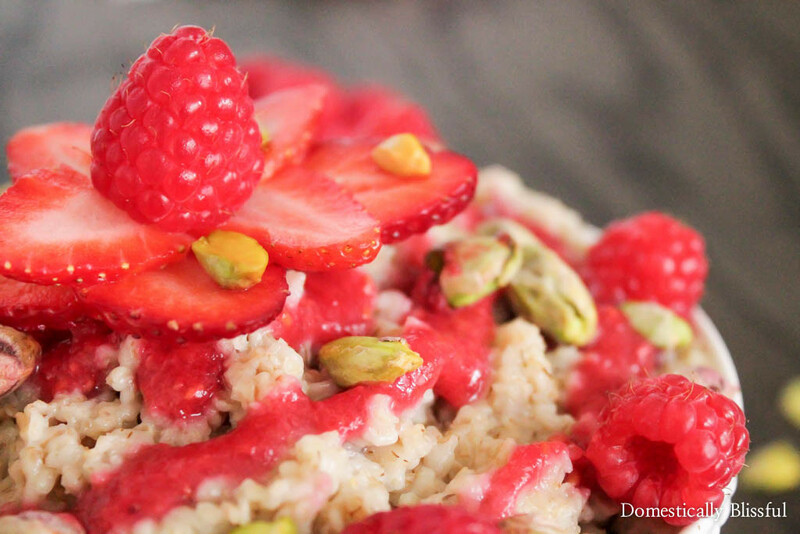 What’s your favorite way to top oatmeal? 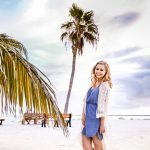 Tell me in the comments below, Tweet me on Twitter, or show me on Instagram! I’d love to see your Berry Swirl Oatmeal! This post is sponsored by Quaker® Oats through Social Fabric, but the content & opinions expressed here are my own. Wow this oatmeal looks incredible!!! Im loving the berry and pistachio combo!! Thanks!! I hope you get a chance to try it!